Home Page | blog | How to Prepare for Scoliosis Surgery? How to Prepare for Scoliosis Surgery? Your spine surgeon along with other staff members will guide you through the entire process of preparing for scoliosis surgery. For example, you will be required to obtain medical clearance from your primary care physician. This is required by the hospitals under Spine Surgery India to admit you for surgery. The spine surgeons at the hospitals under Spine Surgery India permit patients to exercise to tolerate the surgery. Pre-operative conditioning will help speed post-operative recovery. The spine surgeons advise the patients to quit smoking because smoking interferes with fusion and it will increase the risks associated with anesthesia given to you. To prepare you for scoliosis surgery your spine surgeon will ask you to donate your own blood or your family members can donate the blood on your behalf. Your spine surgeon will suggest how many units you need to donate. In some cases, the decision depends on the patients or their family member for donating the units of the blood. Also, it depends that how much insurance you need to minimize the requirement for transfusion of blood from the blood bank. What all tests and scans required before Scoliosis Surgery? MRI: MRI is conducted for most of the adult patients so that the surgeon can view their lumbar discs which are lower back. Patients who are dealing with congenital scoliosis and are under the age of 10 years, severe back pain, nerve tumors, unusual curve patterns, rapidly worsening curvature or other tumors are sent for MRI. X-rays: X-rays are required to view patient’s posterior-anterior, back-front, lateral and bending movements. Some patients who are dealing with kyphosis will require hyperextension views such as extended backward. CAT scan: Your spine surgeon will conduct the CA scan as it tells about your nerves, spinal cord, and bones using dye to outline the nerve structures. Echocardiogram: This is an ultrasound which is conducted to examine the heart. Echocardiogram usually required by the patients with congenital scoliosis and with those who had Marfan’s syndrome which means connective tissue disease, and the patients with a history of heart disease. Renal Sonogram: According to the study, around 20 to 30% of the patients with congenital scoliosis deals with the kidney or urological abnormality, so it is important to check renal function before you undergo for surgery. Other Tests: There are some cases where patients need an ophthalmological evaluation. The patients who are dealing with Marfan’s syndrome need a slit lamp examination in which the spine surgeons will examine the interior of their eyes in which lens abnormalities may be found under magnification. Also, they recommend genetic testing for patients with other syndromes. There are cases in which the patient’s primary care physician or pediatrician may also order some tests to be conducted before surgery. What are the Surgical Risks of Scoliosis Surgery? Before you undergo for Scoliosis Surgery you should aware about the risks involved in surgery. 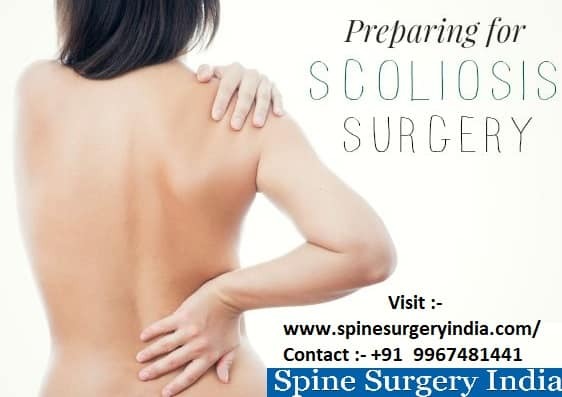 The surgeons at the hospitals under Spine Surgery India will provide some information about the potential risks of surgery and their aim is not to frighten you. It is a part of surgery and you need to keep in mind that there are a majority of patients who had undergone surgery without any serious complications. a) Neurological Risk: The risk of injury to the spinal nerve or cord is very small; less than 0.5% in most of the cases. With the use of spinal cord monitoring during surgery will minimize the risk. A specialist will continuously observe electrical signals in your spinal cord and nerves during your surgery and the changes will be reported to your surgeon. With the help of spinal cord monitoring your surgeon will able to assess that how much curvature correction is safe? The specialist will monitor both sensory and motor tracts of your spinal cord so that a complete picture is available to your surgeon. b) Risk of infection: The risk of a wound infection is low as your surgeon will give you an antibiotic before, during and after your surgery to minimize this risk of infection. If an infection does develop then your spine surgeon will perform an operative procedure to cleanse the wound followed by a period of antibiotics given intravenously or orally. c) Complications with anesthesia: Your anesthesiologist will speak to you about your personal experience of risk on the day of your surgery. If you have a significant medical condition then you will need to meet with the anesthesiologist before your surgery date. d) Bleeding: As we all know that bleeding occurs during all major surgeries. However, to keep the bleeding to a minimum by using a careful surgical technique and low blood pressure anesthesia technique. Low- blood pressure need to keep in a safe range for the patient and for this the spine surgeon will use the cell saver through which they will collect blood in the operative field, filter and wash it, and then immediately return it to you. If you donate your blood before the surgery then you are unlikely to receive a blood transfusion from the community blood bank in most of the cases. e) Blood clots: Blood clots are not very common after spine surgery. Your surgeon is having a concern about blood clot as they move to the lungs blocking normal oxygenation of the blood stream. You need to worn special stockings and compression wraps in the hospital to reduce the risk of blood clots. Your spine surgeon will also suggest you do some leg exercise when in bed and out as it also lowers the risk. f) Instrumentation problems: if an implant becoming loose or breaking is low, in such cases, a relatively small procedure could be performed by your spine surgeon to revise the instrumentation.